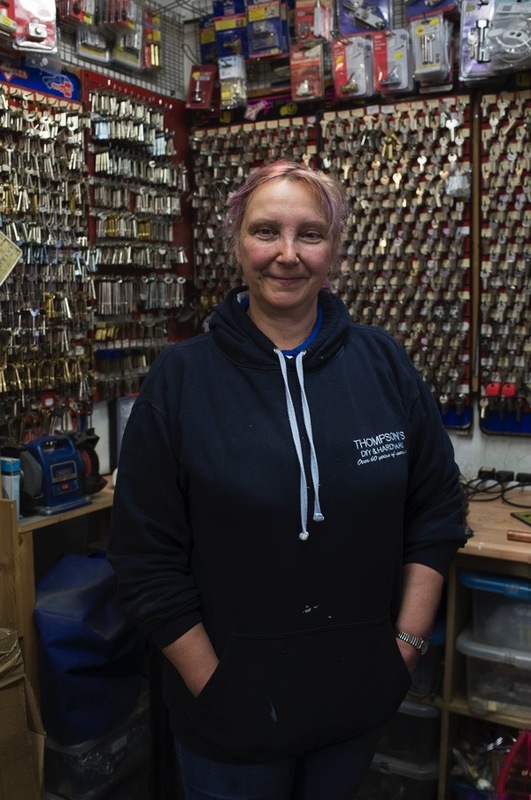 Contributing Photographer Sarah Ainslie & I took advantage of the summer weather to enjoy an excursion down the Roman Rd, the heartland of the East End’s culture of family businesses, and we met the people behind three of the most popular shops. 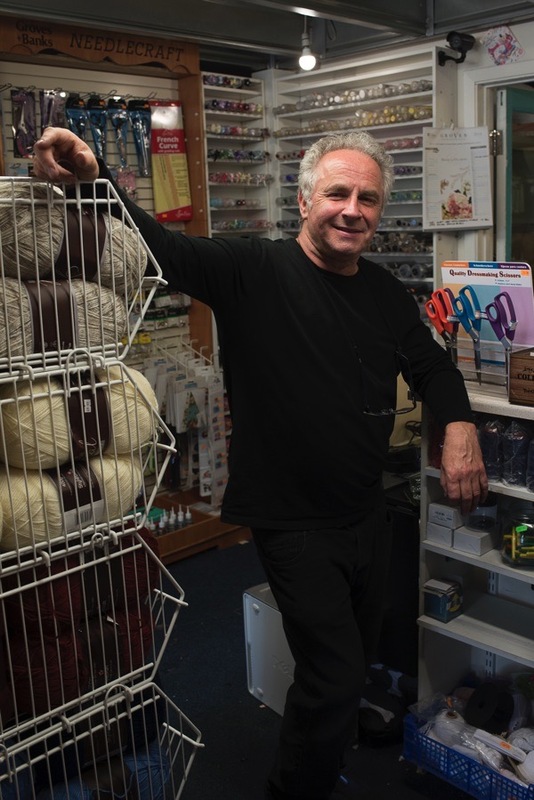 Robert Myers – “My dad, Alfie, started the business in 1947 in Stoke Newington Church St and he was there over fifty years before we moved here in 2000. His elder sister lent him eight pounds, which he paid off over a year, and he started the business on his own when he came out of the army. My father had a partner who ran up a lot of debt and vanished to Australia, so he had to work for another two years to pay that off. My dad was a pretty good sewing machine engineer. The shop was called A. Myers, Sewing Machines. He rented for the first twenty years before he wrote to the owners and told them he was fed up paying rent and was either going to move or buy the premises, so they sold it to him. I joined the business in 1973, straight from school at seventeen years old. I wanted to do anything engineering and my first choice was the auto trade but it didn’t work out. So I worked with my dad. He said, ‘Give it a year and see if you like it.’ We went into the wholesale trade and I enjoyed driving to Europe. We got big at one time but there was no money in it, so we have gone back to how we started. Today, we supply machines to local schools and industry as well our individual customers. My wife Jill handles the haberdashery side of the business and my cousin Mandi, she is a sewing machine engineer and she has been working with me for thirteen years. It is such a specialised trade and we have the knowledge. I have got a lot of knowledge but 80% of it is useless because there is no application for it. I can repair almost any sewing machine. At the peak of the garment trade, there were perhaps fifteen or twenty sewing machines suppliers in Whitechapel area. Some specialised in textiles, some in hat makers and others in leather and footwear. Because we are more specialised we find there is an appreciation for our work. When people buy a sewing machine from us, we don’t just give it to them in a box, we sit them down and show them how to use it. We work a lot for disabled people and I adapt machines for them to use. I love people who have a disability and want to be creative, and it shocks me that other companies won’t be bothered with them. I enjoy the challenge. 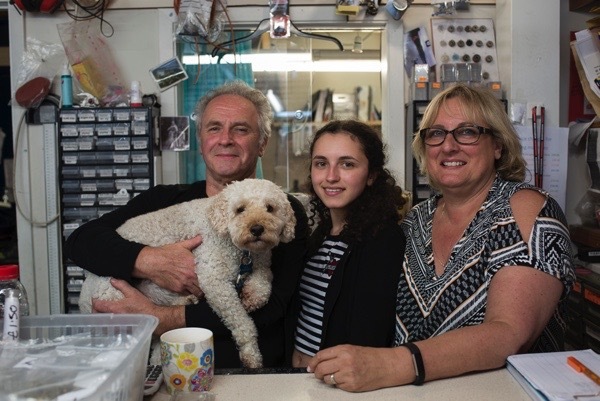 Annette Wakerley – “Four generations of my family have been in this shop. My grandad, George Thompson, had four sons and my dad, Kenneth Thompson, took over the business and it went from him to me and my brother Mark Thompson. He’s round the back and I look after the shop, but Katie my daughter is taking over soon. She is doing all our webpages at the moment and bringing new life into it. I was born into this and I have been here fifty-three years, but the business has been here sixty-five years now. They had a place in Stroudly Walk in Bow before this place became available, it used to be a house and a shop but they converted the whole building into a shop. All shops are going through hard times at the moment and I think we have to change in order to survive. We are developing our website but we believe personal attention to our customers is paramount. Fifty per cent of our customers have been with us forever and the others are new. There is a lot of letting round here so people only stay a couple of years and they come to us when need to repair the property before they so they can get their deposit back. People are busy with decorating during the summer when the weather is nice. Yet there is still a market for draught excluders even at this time of year. We hold a stock of around 12, 000 different items. I do know roughly how you use each item and, if I don’t, my brother does. 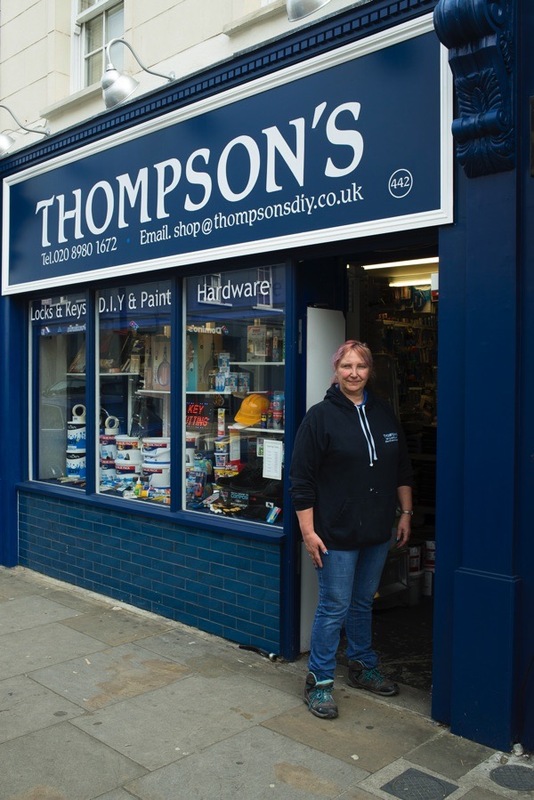 Sharon Adams – “This shop has only been here twelve years but before that it was on the corner since the nineteen-fifties. The Denningtons all died a long time ago but my dad worked for them for years and became a director of the company and took the business over in the seventies. 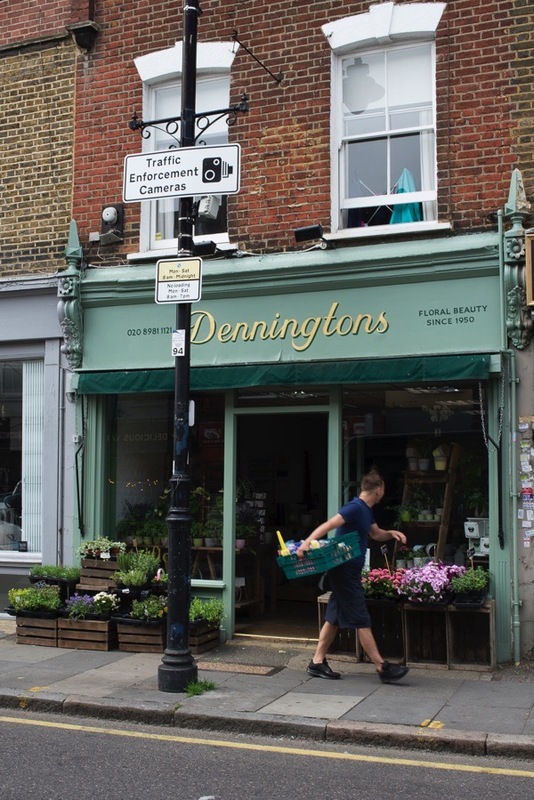 He was a porter at the Covent Garden flower market and Mr Dennington said, ‘Would you like to come and work for me?’ That was how they met. There were five shops at that time, Whitechapel, Bow, Forest Gate plus two shops and a flower stall in the Roman Rd. When my dad retired twelve years ago, my brother came into the business and we took it over together. Originally, I was a Saturday girl when I was fourteen years old and I used to spend my wages on dinky toys for my little brother that I bought From Gary Arber’s shop. I am sixty now and my son Lee runs the business today. 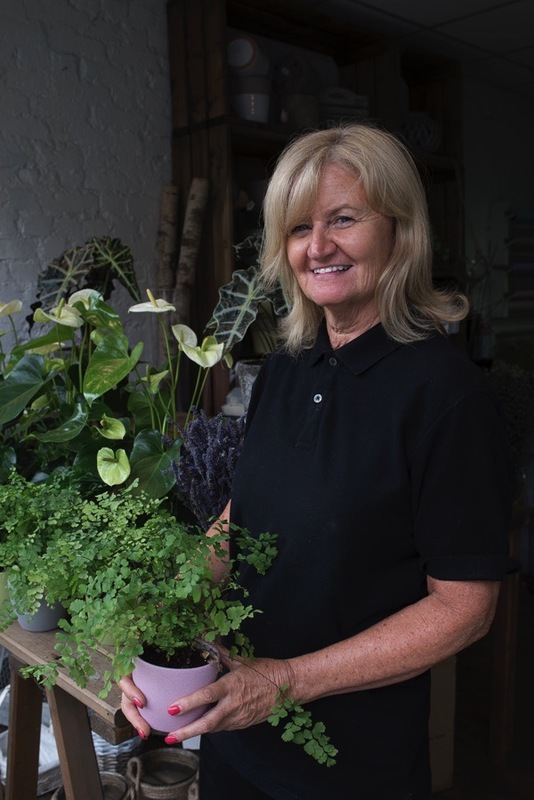 Great to see local businesses like these with real Londoners running them. Such businesses are the lifeblood of the community, and everyone should remember that when spending their money. Time to take a stroll here. Never been. Does anyone remember the toyshop that stood near the junction with Grove Rd? Coming to visit my grandparents that lived in Ellesmere Rd, we walked from Mile End Rd to Roman Rd and I always ran ahead at the junction to make time to look in the window! Thank you Gentle Author for introducing us to all these joyful enterprises in stark contrast to the gloom so often found in your blog posts of other long-established businesses being hounded out due to commercial greed. Good to see these traditional, family run businesses still surviving in Roman Road which has changed so much in recent years. 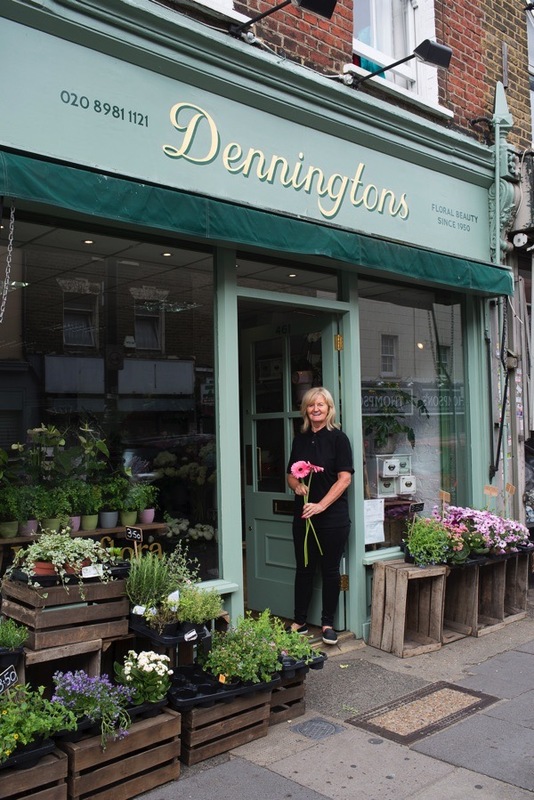 Denningtons the Florist (the corner shop) supplied all our family wedding bouquets in the 1970′s and 80′s and my Grandma used to say they made the best ‘Gates of Heaven’ for funerals……when she passed away we made sure her own ‘Gates of Heaven’ came from Denningtons. Long may these shops flourish and thank you Gentle Author for another trip down the Roman and memory lane. I recently acquired a 1020s vintage treadle singer machine which needed some work. 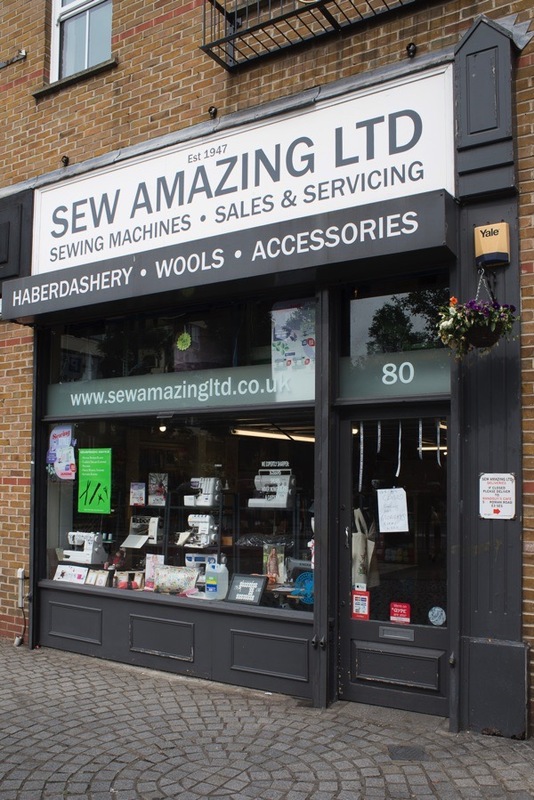 Sew Amazing were recommended to me by a friend who was a professional costumier. I was delighted to find someone local who could get it back into working order, and at a reasonable price! Lovely to know Denningtons are still trading ,they made my wedding flowers in the 50s I wonder if the young man who was ran the stall outside Woolworths on Saturdays is Sharon’s father ,my Mum used to buy me a two bob bunch of flowers from him every week .the Roman was a great market .I no longer live in London but when I do visit I try go down the Roman happy memories. Also the toy shop near the corner of Grove rd I think was called Andersons they also sold prams and cots my grandfather bought my son’s pram for us when he was born his first toys came from there my husband bought the biggest truck I had ever seen for our son’s first Christmas and he was only six weeks old he was much older before he could play with it . Thank you G A .